A locally owned business serving the public since 2003. As member of the Better Business Bureau, we stand behind our products and guarantee all service work. Recognized as one of Jefferson County’s Green Businesses. 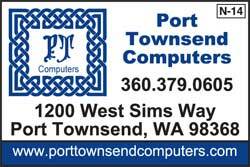 Port Townsend Computers’ technicians are highly trained and competent to resolve a wide variety of computer and network problems. Our General Manager holds a Comp TIA A+ certification and is an Apple Certified Macintosh Technician authorizing him to work on Macs under warranty. We are the only Apple Authorized Retailer/Apple Authorized Service Provider on the Olympic Peninsula.